Disney-Pixar’s outstanding animated family comedy-drama Inside Out is this year’s colossal comedy hit, ringing up $350 million at the domestic box office and garnering a 98% positive rating at Rotten Tomatoes based upon 255 published reviews. Directed by Pete Docter (Up, Monsters, Inc.), the film takes a colorfully inspired journey into the mind—referred to as the control center in Headquarters—of pretty little 11-year-old Riley (voiced by Kaitlyn Davis). Hard at work there are five emotions, led by the always-cheery Joy (Amy Poehler). She strives to make sure Riley stays happy as she operates alongside fellow emotions Fear (Bill Hader), Anger (Lewis Black), Disgust (Mindy Kaling) and Sadness (Phyllis Smith). All five must work overtime when Riley and her family move to a new city, leading to Joy and Sadness getting lost and then having to journey through unfamiliar places in Riley’s maturing mind to find their way back home. 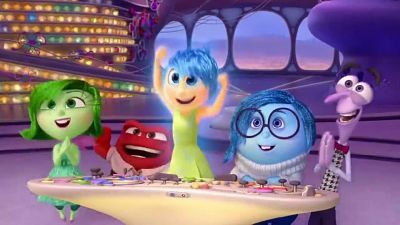 Mixed Emotions – Inside Out‘s filmmakers talk about how they decided which emotions to focus on in the story and how they went about creating each one’s distinct personality and visual identity.